Beginners guide to DJ equipment and gear choices: The essential guide! Numark Mixtrack Pro 3 Review: Is it the best DJ controller in its price range? Today we learn exactly how to use DJ headphones for cueing, beatmatching, mixing, and lots more! When you're ready to learn cueing and beatmatching, you'll need to learn how to use headphones. DJ headphones will let you listen in private to the non audible channels of your equipment. This means that tracks that have been loaded into any channel can be heard by the DJ, but not by the crowd. 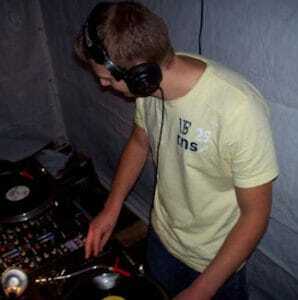 The DJ will get the tracks ready for mixing by using the headphones, and then choose when to make the channels audible. When learning how to use a mixer we learned that every DJ mixer will let you plug in a pair of headphones. The mixer will also have a headphone volume control, most will also have a cue mix. Some mixers will have cue buttons to let you select the channels that you want to hear in the headphones. If you haven't got a mixer yet you can check out the best mixers on the market HERE or the best controllers HERE. Somewhere on the headphone panel of your mixer will be a headphone volume knob. This knob will control the volume of all channels in the headphones only. The main speaker volume, AKA the master volume will not be affected. Many DJ mixers will also have a cue mix, this could be a rotary knob or a mini crossfader. When the knob or mini fader is in the central position you will hear both/all channels. When the knob or fader are positioned left you will hear the left channels (1 and 3). When they are positioned right you will hear the right channels (2 and 4). You can move the knob/fader around to blend the channels in the headphones, the same as you'd do with the main crossfader. This helps you to match beats and EQ the next track. You can also slide/turn it either way to isolate a single channel for cueing, or to scan through a track. The cue mix is something I will always look for when buying a DJ mixer, for me it's essential. Cue buttons let you select the channels that you wish to hear in the headphones. Some mixers will also have cue buttons for separate functions like effects, samplers, and booth monitor. These are usually only found on more expensive feature packed mixers or controllers. By isolating certain channels you can beatmatch and cue up multiple tracks. 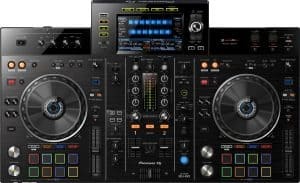 This is great for DJ's using multiple decks, and for performance DJing. To cue a track you will need to adjust the headphone volume until you can clearly hear the track over the main speaker volume. Be careful not to set the headphone volume to loud as you could cause hearing damage. When DJing in louder environments it's a good idea to get yourself some DJ earplugs to reduce the risk. 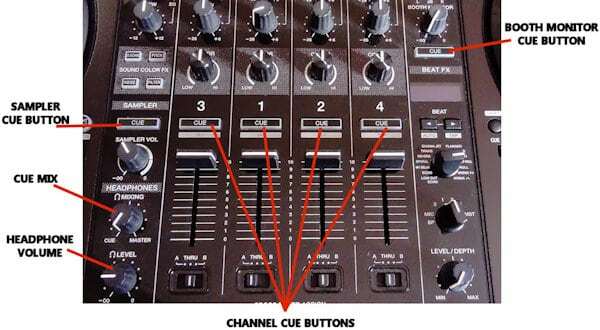 If your mixer doesn't have cue buttons move on to the next step. When your volume is set select the channel you want to cue by pressing the correct cue button. The button of the channel that is assigned will usually light up. You'll then hear the channel in your headphones ready to cue. You can now set the cue mix so that all other channels are silenced. Slide the mini crossfader or turn the knob to select the correct channel. You should now only hear the track you want to cue through your headphones. You can now hear the channel perfectly in your headphones and you're ready to cue the track at the correct point. If you're unsure what cueing is, you can check out my whole article on cueing. This article will tell you what cueing is and what cue points are. It'll also show you how to set cues and hot cues using the buttons on your mixer/controller. Check it out by clicking here. The next thing you'll need your DJ headphones for is beatmatching the tracks. Manual beatmatching using headphones is still one of the most important skills to master as a DJ. Even if your equipment has a sync button, you still need to learn how to beatmatch. Sync isn't always reliable, it doesn't work well with certain genres, and not all equipment has the function. This is where you'll need to use the cue mix to get the two tracks lined up. Your first track is already playing and is audible to the crowd, the second track is loaded and is only audible to you the DJ. As you press play and begin to beatmatch you can wear the headphones and set the cue mix to the central position. As you're matching the two tracks you can make small adjustments to the cue mix to help you get the perfect beatmatch. Sometimes you may wish to hear channel one slightly louder, sometimes channel two needs to be more prominent. As you learn to beatmatch you will find the cue mix super useful, that's why you should always buy a mixer with this option. If you need a full explanation on beatmatching check out my article on mixing. 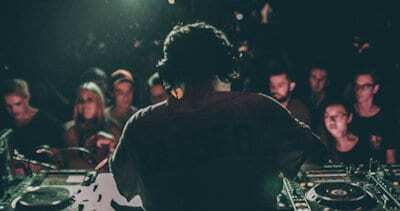 The article will teach you every step needed to master DJ mixing. You can also use the cue mix function to EQ your tracks ready for mixing. You can use the mini crossfader just like the main crossfader to practice the mix in your headphones before doing it live. You can also use a rotary knob exactly the same by turning from channel one to channel two etc. EQing is another really important skill for beginner DJ's to learn from the beginning. There's a full explanation on DJ EQing HERE. When you've learned how to cue, beatmatch, and EQ by using headphones you can choose how to wear them. Some DJ's will be able to mix while wearing their headphones, they will not remove them throughout their set. This method requires lots of practice as you won't be hearing the main speaker volumes. The cue mix will be very important so choose a mixer with this option. Lots of DJ's use one ear headphone monitoring to mix a DJ set. A good set of headphones with swivel joints will be needed so you can use your shoulder to hold them to your ear. You'll be able to hear the main speaker output as well as the incoming track through your headphones. This is the preferred method for DJ's without the cue mix option on their mixer. Many DJ's will choose to beatmatch, EQ, and cue up the track while wearing the headphones. Once the track is playing and ready to mix they will remove their headphones and mix without using them at all. This is the method I use. The only time I will use headphones while in the mix is if I need to make small beatmatching adjustments. Finding the right headphones for DJing is important. We just mentioned that some styles of mixing will require things like swivel joints. But this isn't all, there are certain requirements that DJ's need that some headphones just don't provide. There are many different headphone options available and choosing the right ones for yourself is very important. For a full headphone buyers guide and all of the top recommendations go HERE. Use headphones as a DJ microphone! You can obviously use DJ headphones for other things like general music listening and gaming. But there's another use which is a little known DJ secret that could come in really handy. If you ever need to talk to the crowd but there isn't an available microphone, you can use your headphones! This works because headphones and microphones both contain a diaphragm that vibrates. The only difference is that your headphones vibrate the diaphragm to create a sound, but microphones monitor vibrations from your voice before it's amplified and sent to the speakers. All you need to do to use headphones as a microphone is plug your headphones into the mixer's microphone socket. Headphones and microphones usually use the same 1/4 " jack plug connector, but if the connector is different simply attach an adaptor. Once connected to the mixer, slowly increase the volume and speak into the headphone's ear cup, it's that simple! The sound quality won't be as good as a regular microphone, but it's a great trick to get you out of trouble. When you use headphones as a microphone you may experience a high pitched noise from your speakers. This is known as feedback and is more likely when you use headphones as a microphone. This is because the headphones have a much larger diaphragm than a microphone, making it really easy to pick up feedback. Feedback happens when the sound from your main speakers re-enters the sound system through the microphone. It is then amplified over and over and over, this creates the annoying high pitched squeal. The best thing to do to control feedback is turn everything down. If this isn't possible just turn down the booth monitors so the main system is still audible. If you still have feedback point the microphone/headphones away from all main speakers. Keep the tail end of any microphone pointed towards the speakers at all times. And remember, when you've finished speaking, turn down the microphone volume on the mixer, or unplug it. Now you can use headphones to DJ you'll want to move onto the next step. The next step is learning all about your mixer or controller, so do that here -> MIXER and CONTROLLER. And then you can learn all about beatmatching, counting beats, EQing, and mixing HERE. And if you haven't got any headphones yet, check out the top DJ choices here -> TOP DJ CHOICES.